If MacGyver were here...: Small? I was a little surprised today when I thought id pop into MacD’s and pickup a fat-packed breakfast to get me going for the day. I didnt know what to think when the fast food attendant handed me what was supposed to be my drink!? 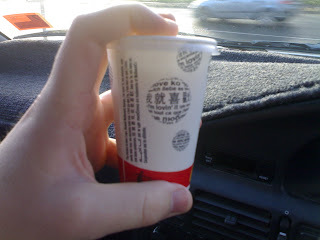 I swear the last time I had MacBreakfast the cups where twice as large! Oh GUS! Please don't eat that! !